A new series of heat-stable (st) mutants of bacteriophage T5, which contains deletions in the tRNA gene region, has been isolated. An accurate mapping of the deletion boundaries for more than 30 mutants of phage T5 has been carried out. As a result of the analysis of nucleotide sequences flanking the deleted regions in wild-type phage DNA, it has been shown that they all contain short, direct repeats of different lengths (2–35 nucleotide residues), and that only one repetition is retained in the mutant phage DNA. On the basis of the obtained results, it was suggested that deletion mutants of the phage T5 are formed as a result of illegal recombination occurring with the participation of short repeats in DNA (SHDIR). Based on the example of two mutants, it has been shown that the resistance to thermal inactivation depends on the size of the deleted region. Original Russian Text © A.S. Glukhov, A.I. Krutilina, A.V. Kaliman, M.G. Shlyapnikov, V.N. 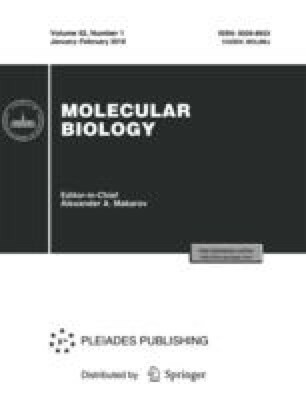 Ksenzenko, 2018, published in Molekulyarnaya Biologiya, 2018, Vol. 52, No. 1, pp. 3–9.